The topic is closely related to the topic MSP Strategies – since it sets the conditions for enabling an objective ‘evaluation’ of MSP performance. 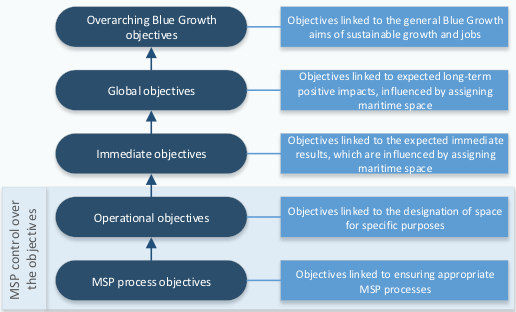 It is also linked to the topic MSP for Blue Growth as this section contains advice for developing indicators to measure the blue economy and link it to MSP. Evaluation of ecological aspects is also linked to the topic Ecosystem-based approach that provides examples of guidance and tools that might be useful for this scope. The MSP Platform developed a Handbook for developing MSP indicators as part of the study MSP for Blue Growth. This handbook helps authorities to define objectives for MSP and to develop appropriate indicators to monitor the MSP processes and link their outcomes to Blue Growth. As shown on the bottom of the page, there is also a good set of practices available, which can be used to develop in this field further. Most of the offered indicators have been developed to support communities and authorities to self-assess their progress towards sustainability goals and their performance of MSP processes. Some of the practices refer to ecological aspects, and less so to socio-economic questions. Performance monitoring and evaluation is a key need for every MSP process, as well as the resulting maritime spatial plans, in order to check the effectiveness of measures and adapt to changes in environmental conditions and uses of the sea and to asses if the plans are “successful”. Therefore, MSP can benefit from both quantitative and qualitative assessments. Qualitative assessments are based on various checklists and other procedures related to involvement of experts and stakeholders. Quantitative assessments usually offer results that can be compared in time. Although usually they are unable to cover all MSP aspects they can inform the evaluation process, trigger relevant ”qualitative” evaluations and serve as a starting point for more complex discussions on MSP performance. Quantitative evaluation requires that MSP objectives are linked to appropriate indicators – in order to allow their measurement and evaluation of the performance of each management action over time. Indicators can act also as early warning signals. The Handbook on MSP Indicators presents a step-by-step approach to formulating objectives for MSP and to developing the appropriate MSP indicators customized to the context. These indicators allow monitoring different dimensions of MSP measures and assess the achievement of targets at different levels. There are no one-size-fits-all solutions for MSP and related indicator development, which is why a flexible approach is needed and customisation to local contexts. A short hands-on version of the manual exists alongside a more in-depth version. How can objectives for MSP be formulated and linked to indicators? Specific: Objectives should be concrete and not too broad. Measurable: Objectives should ideally be formulated in a way that allows quantification. Achievable: Objectives should be reachable within the given timeframe and the relevant context. Relevant: Objectives should correspond to the needs identified. Also, the objectives should be influenced by MSP. Time-bound: Objectives should be situated in a specific timeframe. Only process and operational objectives are within the control of the MSP authorities, while the other levels are impacted by MSP and external factors. High-level objectives should still be taken into consideration in the planning processes, as they often result from political plans in which MSP is situated. Overarching Blue Growth indicators. In line with the Blue Growth Communication, jobs, added value, and GHG reduction can be used as overarching indicators. Depending on the MSP objectives, authorities can customise the indicators to a specific sector of the blue economy. These indicators are mostly to be used as context indicators rather than for measuring the success of MSP. Impact indicators (e.g. MW of wind power generated at sea) measure the achievement of global objectives and observe the evolution of Blue economy sectors. Outputs and outcomes have influence over these indicators, but they extend beyond the control of MSP authorities. Outcome indicators (e.g. Capacity of oil / gas installations at sea) are linked to the different sectors of the blue economy and reflect socio-economic and ecological aspects. Some are controllable by the MSP authorities, while most of them are not. They can also be developed to measure efficiency of different maritime uses, by linking a certain output to the space assigned to the activity. Output indicators (e.g. Maritime space assigned for tidal energy installations) are a direct product of MSP processes and measure progress towards operational objectives. They should be linked to operational ecological objectives, consider land-sea interactions (as required under the MSP Directive), but can also monitor blue economy sectors. MSP process indicators can be quantitative or qualitative. Qualitative indicators (e.g. Availability of sufficient staff assigned to MSP processes) may be binary or use appropriate scales. Quantitative indicators (e.g. Number of consultations held with neighbouring countries) consider aspects of the MSP processes that are directly measurable and quantifiable (stock-taking, coordination, securing resources, stakeholder perspective). A shortcoming of quantitative indicators is that they might not account for the quality of the processes. MSP authorities may ideally develop a combination of both types of indicators. Additional Ecological indicators monitor include specific ecological objectives included in MSP, however these are usually broad horizontal objectives and are related to objectives for certain Blue economy sectors. The MSFD (Marine Strategy Framework Directive) sets out the marine environmental objectives and the descriptors used by MSFD can be used as ecological indicators for MSP processes. Consider the Blue Growth objectives (jobs, growth, safeguarding biodiversity and protecting the marine environment), national strategies/policies/action plans, as well as objectives set out in regional and local strategies/policies/action plans. Define objectives for the different sectors of the blue economy. Define objectives for the MSP process. Take into account the various levels and structure them logically. Ensure the objectives respond to all SMART criteria. Discuss and agree on the right type of objectives with the right stakeholders. How can MSP authorities define indicators? After MSP authorities have defined the MSP objectives, planners can design or select appropriate indicators for each level. The Handbook on MSP Indicators suggests to first consider the availability of information. At the higher levels of indicators (e.g. impact), information sources are mainly official statistics. Regarding indicators on aspects under control of the MSP authorities, data can be collected from stakeholders, existing studies and from the authorities themselves. Verify if the indicators are cost-effective with regard to the cost for obtaining the data. Consider all available sources of information and verify if the data is validated. Ensure the data is up-to-date, available at the required frequency, at the correct geographical level. Next, planners should define baseline values for each indicator. The value set as the baseline will be used to compare change registered by the indicator. The baseline allows making an initial assessment of the situation and monitoring improvements or deteriorations linked to MSP. Identify baselines for every indicator. If not possible, explain why there is no baseline. Set the baseline year as close as possible to the year of adoption of the MSP. Baselines can be taken from a preceding generation of maritime spatial plans. The third step is to identify external factors and to set target values that are aligned with the objectives. They may include interim and final targets. External factors outside the authorities influence are more significant at the higher levels and reduce their control over reaching the target values at these levels. In addition, authorities should clearly flag any assumptions made to reach the target values. Therefore, the validity of these assumptions also needs to be verified in time. Consider all main external factors that could affect the reaching of the target values. Clearly state the assumptions that need to hold true in order to reach the expected targets. Make sure the indicators are achievable within a given timeframe and context. Make sure the indicators are time-bound, so that targets are set for an intermediate/final year of achievement. Ensure that baseline values and target values in the same measurement unit and result from the same calculation methodologies/sources. The guidance provides a draft plan of the Bothnia Sea. The map is followed by draft recommendations for certain designated issues. It aims to stimulate discussion around what a transboundary plan of the Bothnian Sea could look like. The plan also refers to environmental assessments and their requirements when preparing for certain sectors. Shape pilot project implemented in Puglia Region focused on assessment of the environmental features and problems affecting the marine and coastal zone of the Marine Protected Area (MPA) of Torre Guaceto and the neighbouring port and industrial area of Brindisi. Using the 27 climate change indicators developed by the European Expert Group on ICZM, COINS helps coastal planners take account of potential future impacts of climate change in their work. It is a web-based tool built on open source components and can be used free of charge. In 2015 an update has been made of the integrated management plan for the Barents Sea – Lofoten area. The plan in place, developed in 2006, already had some updates during the years, integrating new research findings and stakeholder input. This version is the new official update of the Management Plan. Development of an evaluation framework for assessing the quality and effectiveness of MSP in transboundary contexts. The review focusses on the effects of the policies, the effectiveness of the policies in achieving the plan objectives, and progress towards these objectives. This project aimed to gain a better understanding of decision-making using adopted marine plans in England (UK). The Handbook presents a step-by-step approach to developing MSP indicators. In particular, the Handbook aims to provide the maritime spatial planning community with suggestions on the use of spatial indicators that could support the consideration of Blue Growth in MSP processes. The MESMA Central Exchange application provides a framework to evaluate and monitor the management of spatially managed marine areas. The central part of the MESMA spatial management tool box is a generic and flexible framework which describes a best practice process of how to assess a given spatial management within a discrete marine area with clearly defined boundaries in space and time. Comparative analysis of three coastal regions from Poland, Lithuania and Russia with regard to ICZM indicators. The Baltic SCOPE project has developed guidance on evaluation and monitoring transboundary MSP. This publication provides methodological guidance by introducing a framework for criteria and indicators to be used in evaluations with a focus on transboundary aspects. Review of the Monitoring and Evaluation framework presented in the MMO’s East marine plans Implementation and Monitoring Plan to assess whether it is fit for purpose and can provide a framework that can be utilised for subsequent marine plans. This set of practical information presents GIS tools for elineation of marine and coastal biophysical properties and for identifying specific ecosystem components. The DeCyDe for Sustainability tool is a spreadsheet based set of indicators and decision support tool that allows coastal communities and Authorities to self-assess their progress towards sustainability goals. The tool examines strategic targets within existing policy, applying sustainability indicators and applying the decision support tool. The Med-IAMER project identified a wide number of indicators used to display spatial information about socioeconomic drivers and environmental pressures in the Mediterranean region. A specific “cumulative pressures” indicator was also formulated, accounting for the interactions among the six major drivers.